Put selling in my opinion is vastly superior to selling covered calls. Here are my top 10 reasons why put selling beats selling covered calls every time. In this article I am using both terms, writing puts and selling puts as they are both the same. As well, the term, writing covered calls, is the same as selling covered calls or as some investors refer to it, simply, covered calls. The debate over whether Put Selling, often called selling puts or writing puts is basically the same strategy as Selling Covered Calls also called writing covered calls or simply covered calls, has raged for years. Investors seem entrenched on one side or the other. Just go to any option forum and post that one or the other is “Superior” and you will get a heated debate. It’s actually disappointing because both strategies, Put Selling and Covered Calls have their place and time within an investor’s portfolio. There really is no need for debate. Over 35 years ago when options on many stocks were just getting started I was introduced to selling stock options such as put selling to lower my overall cost of entry into a stock. As the years have passed I have developed various put selling strategies that have shown to me how flexible and truly exceptional put selling is in the arsenal of investing. Leaving aside tax implications involved in covered calls and put selling, I have come to believe that put selling is superior to covered calls in many ways but here are my top 10 reasons. Through put selling, I can buy into a stock at a discount to the prevailing stock price. If I am wrong and the stock moves higher, I am paid a premium for my effort. All the while my capital sits aside earning interest. I can try to do the same with covered calls but it requires me to place my capital at risk by holding the stock and selling in the money covered calls. With put selling, my capital sits safely aside earning interest and I have opportunities to roll my puts lower to avoid being assigned stock in the event of a market correction. Writing covered calls has two parts to the trade and two commissions to be paid. First I have to tie up my capital in the stock and then sell the call. If the stock falls, I can try to get out of the stock but normally this will result in a capital loss and if I close my covered calls, I am back paying two more commissions. 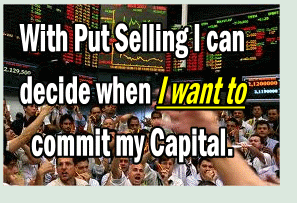 With put selling or writing puts, I sell the put and keep my capital earning interest. I pay one commission. Meanwhile as the expiry date arrives, the premium evaporates on the sold put, and all the while my capital still sits waiting. If the stock should pullback and place my sold puts in the money, I can buy back and roll out the puts either further out in time for even more premium or roll it down to follow the stock lower. When I roll lower, often I can roll further out in time and still move lower for a net credit rather than debit. Many times I can follow the stock lower and still earn a credit. With Put Selling as my capital is not invested, my margin amount is higher allowing me to do more put selling. In an uptrending market this can really add to my profit. I can often write a lot more puts than I can covered calls on the same stock as more margin is available to me. An investor though has to be careful and prudent as this can be a recipe for disaster if an investor does more put selling that they can actually cover with capital in the event they are assigned more shares than they bargained for. Selling stock options such as covered calls with leaps is even worse as it ties up my capital for an even longer period of time as I have to hold covered calls and the stock. Put Selling Leap puts, allows my capital to be free for a longer period of time, earning interest and being applied to other trades. I can often time my trades so that I know how much capital I will need when the leap puts expire giving me months to apply my capital to more put selling until the leap put gets closer to expiry. Basically I can almost double up on my capital. Therefore I often sell a few leap puts on all my positions just to garner more income and who knows, maybe I will end up owning the stock at a greatly reduced price. Put selling almost always allows me to determine when I want to be assigned the shares. As long as I watch the sold put and roll it prior to it expiring I am almost always able to avoid being assigned. Normally I roll about 1 to 3 weeks before option expiration depending on the price of the stock and if the sold puts are deep in the money. You can read more about put selling but going to the index. This one bears repeating, selling covered calls takes two commissions while put selling takes just one. You might say, “wait, when I sell a covered call I can sell above the stock price and earn the call premium and should the stock move higher I also have an extra capital gain.” This is definitely true. However I check the 10 day simple moving average against the 20 and 30 day exponential moving average. If the 10 day is showing an uptrend, then I sell a slightly ITM put and if the stock moves up I reap the share price increase and I am still holding the sold put. If the share price moves above my sold put price by expiry then I have captured all the put option premium AND had the put expire worthless. How great is that! On my website a number of my stock trades in the portfolios show this strategy at work. In an uptrending market this put selling strategy can work wonders. On stocks that are in an uptrend, I can sell a string of naked puts and capture premium all the way up and still end up with my capital intact in an investment account and enjoy the gains of the stock without ever owning it. I did this on the rise in XOM starting in September 2010. While not as good as actually owning the stock outright, it gives me greater flexibility as I can sell naked put contracts as the stock rises, close them for a profit if the stock continues to rise and sell contracts higher, following the rise in the stock. When the uptrend begins to stall, I can close my naked puts and be done with the stock, or I can look the position over and decide to close and sell naked puts further out in time in case the stock again moves higher or if it moves lower, to capture more premium on naked puts as the stock begins to fall back. The most amazing put selling strategy that I enjoy is rolling my puts constantly and garnering the income from put premiums, until eventually I am no longer using my capital, but other investor’s capital to actually own the shares. In Oct 2008 I began selling naked puts on Kraft and by June 2010 I had earned enough capital to purchase 500 shares and move my capital to another stock and begin the same strategy. This is the ultimate in put selling as an investment method, owning shares that did not need my capital. The Kraft trade is on my site under my US Portfolio. Meanwhile Kraft during that period moved about 6 or 7 dollars, from its low during the financial crisis to its high in 2011. Use this put selling link to check Kraft’s current price and put options. Finally my last put selling reason is how I use the earned income from selling puts to sell even more puts. How great is that – making money on other investors’ capital. Leap puts are great for this strategy. A good example is my Coca Cola trade . On Feb 4 2010 I looked at Coca Cola and felt that I would be happy to own the stock at the $55.00 strike. The stock was trading at 53.43. I sold the Jan 2011 $55 naked put for $6.05. If assigned at $55.00 my cost basis in the stock would have been $48.95. On the other hand, if I was wrong and the stock rose above $55.00, I was being paid 6.05 or 11% to wait. I sold the puts, earned the capital, and then used that capital from my KO sold puts to sell more puts on Kraft and meanwhile had no funds tied into either Coca Cola or Kraft shares. So now I was using other people’s money to not only help pay for any possible assignment on Coca Cola, but to sell naked puts on Kraft. My Coke trade, which is still ongoing, can be seen on my website, under the US Portfolio. The flexibility of put selling is excellent and requires me to only follow the put strike valuation I have sold. With covered calls I have to watch the price I paid for the stock and the covered call I sold. The time required for monitoring and planning put selling is much less than with stock bought and covered calls sold. 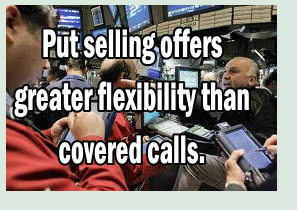 The flexibility of put selling can not be overstated. These are just 10 points. Over the years I have developed many put selling strategies. They include everything from rescuing stock positions that had large losses, to earning income from rapidly rising stocks without ever owning the shares. When selling stock options, put selling is my number one choice of investment methods in my arsenal of tools. With put selling I fear no swings in the market. 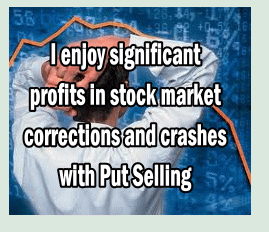 I welcome whipsaws and corrections as every rise in volatility just increases the premiums I earn through put selling. I believe every investors should study and paper trade put selling strategies until they find those strategies that aid them in earning capital, growing their portfolios and protecting their assets. Thank you for your extensive comment. I would prefer to pick a company that is not on the verge of bankruptcy such as Kodak. I would probably pick perhaps insurance companies that are badly beaten up such as manulife MFC stock symbol or some of the banks like BAC or C and test out strategies against those simply because they have a much better chance of surviving. Your comments are most welcomed. Thanks for the update. I will get that fixed. I have done leap put selling for more than 20 years. There is nothing wrong with it but you should consider the likelihood of assignment. Selling leaps is a bullish strategy that can often see stocks assigned. I will try to post some articles about leap put selling. There are a number of leap puts in my portfolio now including Coca Cola Stock which are on my website. Do you ever roll a put for a debit to avoid assignment? This article suggest that it may happen in some occasions. Do you always sell ATM or slightly ITM put? This means you need to be more often directionally right. Rarely as I prefer selling put options against stocks I would own. I sell put options sometimes at the money, in the money and out of the money depending on the stock and the strategy being used. My approach is not always selling put options with the intent to never be assigned. It comes down to the stock being sold against and the reasons for selling options to begin with.